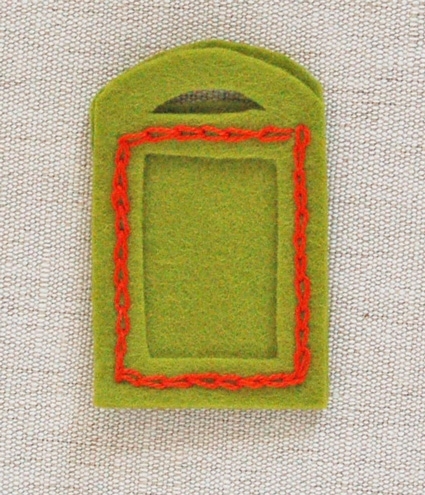 These cute gift tags are a great way to use felt scraps. I wanted these to be a fun, stress-free kind of project because as we all know, no one needs any added stress during the holidays. With all the travel, shopping, cooking, and entertaining going on I just wanted these tags to be a nice thing to do while watching holiday specials on TV or hanging out by the fire. If you get 3 of them done, great! If you manage to sew a dozen, bully for you! There’s no pressure, you already have the presents, this is just the cherry on top! 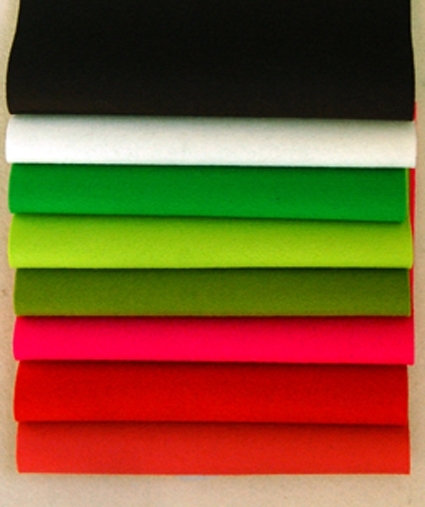 Holiday Wool Felt Bundle or leftover pieces of any wool felt. Cut a small rectangle from your card stock using the template, put this aside. 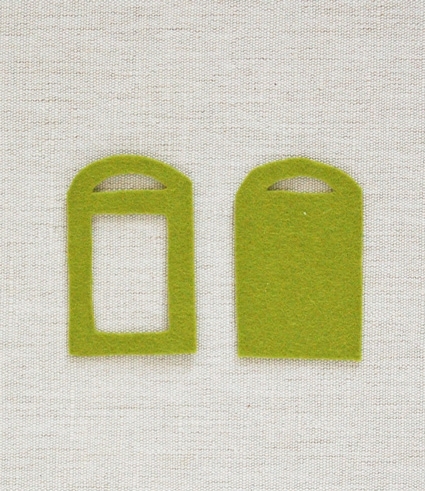 Trace both template pieces onto a piece of felt and then cut it out. 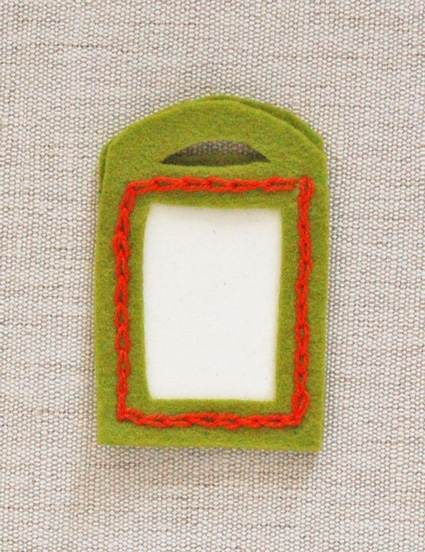 Using a pencil or water soluble fabric marker draw a line 1/8-inch around the “window” section of the open felt piece. 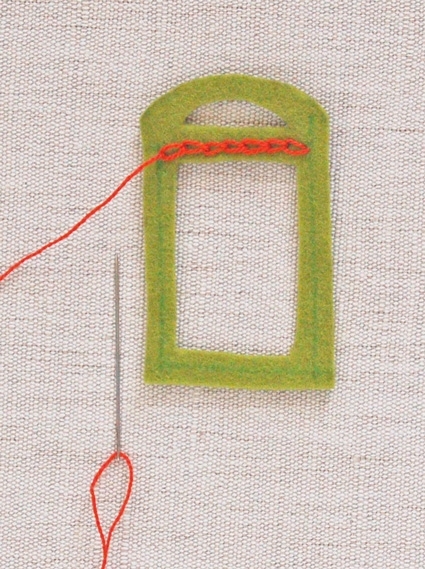 Using a chain stitch embroider across this marked line starting at the short side nearest the loop as shown above. Pin the back piece of the felt to the front window piece, wrong sides together. The back doesn’t have to look perfect but you should make sure that you are sewing both layers together. Stitch around the entire marked line. 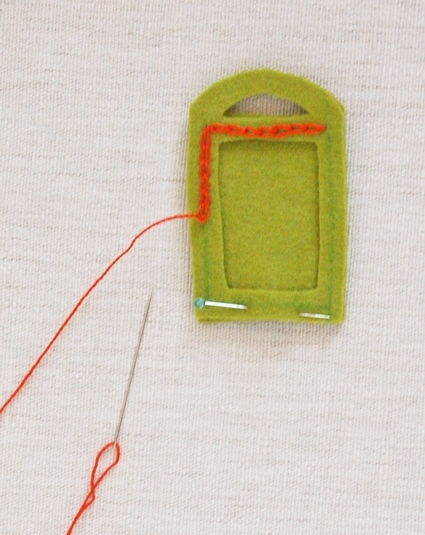 Slip the small piece of card stock that you cut from the template into the window through the opening by the loop. 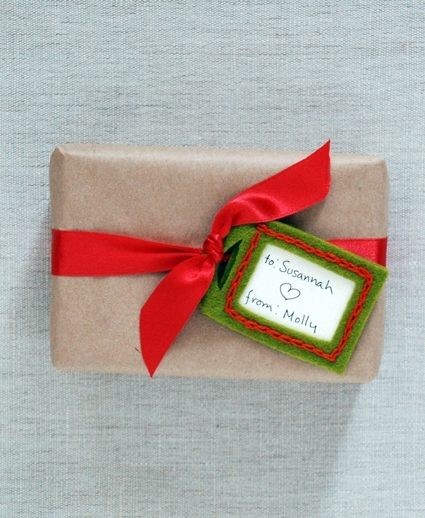 Write on the card stock and tie the finished tag onto your packages through the loop. 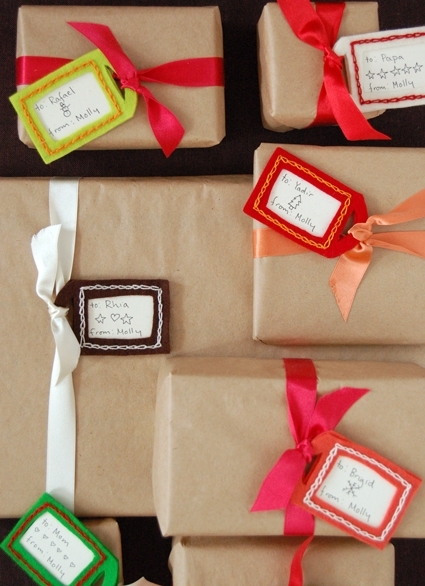 Repeat for as many gift tags as you want! These are adorable! 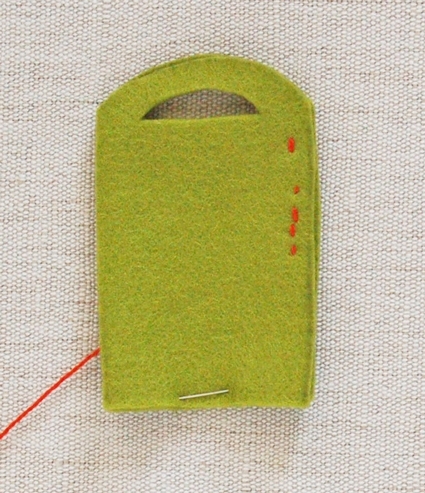 And perfect for some simple handstitching while just sitting down for a minute. This is an amazingly clever idea–quick and easy and it looks fabulous on the packages. Thank you for sharing this project! What an great, useful project! 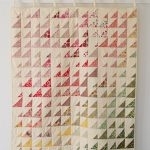 While I may not get any done for this year, I am adding these to my list of wrapping items for next year. Well done, Molly! Holy crappers- I just made one and it is adorable! I used knitting tools to do it- yarn needle (wouldn’t recommend this, it was very dull), lightweight yarn and felt scraps. Very easy and fun. If I hadn’t used up what I’ve got of felt, I would have made these! Very nice, and they dress up the present well. I might try to make a few (small) ones with the scraps I have left. What a marvelous idea! If you made the card piece the same size as a business card, these could also double as cute luggage tags – a double gift! They are so beautiful,simple and classic. I’d like to add some printed fabric in the back. Thanks for sharing. Happy Holidays! Thanks so much! I’m too late for Christmas holidays but plan to make some for all the upcoming birthdays and holidays. Your creativity is truly inspiring. Thanks for taking the time to share with everyone. What a brilliant tutorial! 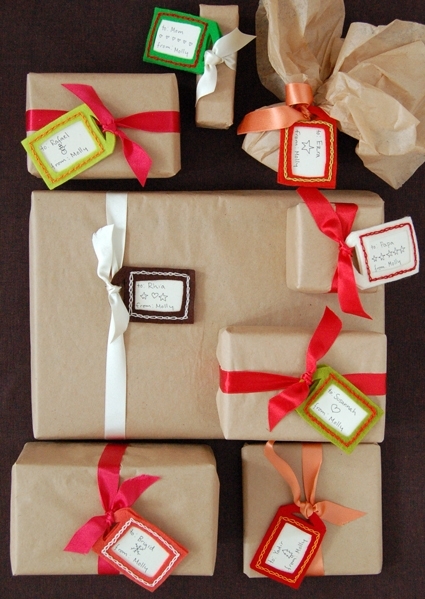 These gift tags look great and I’m looking forward to making some! I know I'm late to the game, but these are – seriously – so cool. I love that with the extra time and care that goes into hand-stitching these, they can be reused and pulled out year after year. What a sweet tradition!